Donate to HelpHOPELive for Jefferey Alan March. We would like to congratulate the winner of Jeff’s 50/50 raffle. The winner is Evelyn Lauchenauer form Los Angeles, California. A special thanks to Mary Young for organizing the raffle. Jeff and I wish to THANK everyone for their support and donations in his honor. There have been several donations by ANOMYMOUS donors that has been accepted and greatly appreciated. Jeff has settled into the hotel near the hospital just fine. He goes to several Dr. appointments weekly and PT for 2.5 hours daily. On weekends he walks and walks and walks the hotel halls. His tube feedings are going ok also. Visitors are welcome at the hotel most anytime. 12/27/16 Jeff continues to improve daily with the exception of continued difficulty eating, being unable to swallow solid foods. By weeks end he should graduate to a motel room near the hospital. Jeff must continue to go to Dr. Appointments, tests and intense exercise daily for a month. His expenses will increase with housing, travel and tube feeding which are not covered by insurance. Your tax deductible donations to HelpHopeLive.org in his behalf continue to be greatly appreciated. Remember donations by 4PM December 30th are tax deductible for 2016. 12/18/16 Jeff is in his private room improving daily. Walking now yet still doing tests daily. He may need more surgery soon. Will update at that time. 12/12/2016 Jeff is now out of ICU and in a private room at Methodist, Indianapolis. I’ve got an update for you on how Jeff is doing. First, I just want to tell you how much of a difference you have made in our lives with your support and donations in his honor. 1. As Jeff is recovering from his surgery, at this time he is at Methodist Hospital in Indianapolis, IN, and there are family travel expenses getting from home to the hospital on a daily basis. 2. Cover the costs of all the necessary medical supplies and personnel that his recovery has already required. 3. To help cover the costs of caregiving, taking care of his home and family. As we move with this journey together, your love and hope sustains us. Thank you. As you know, Jeff received a double lung transplant in November. I want to tell you a little bit about how Jeff is doing right this moment. Jeff has had a difficult week. He was awake for a 2 day period, responding to our questions with Yes and No nodding. After that he experienced some setbacks, due to complications. Because of this, he is once more in a medically induced sleep while the doctors work to resolve the current complications that have arisen. He is breathing on his own at this time, but he is being kept on oxygen as a supplement. He is scheduled for more surgeries during the first part of the coming week. We are keeping a careful watch on him and it is a beautiful thing to witness his daily improvements! However, we are also aware of how long his recovery will be, and there is a challenging road ahead of us. So far, you have managed to help us offset the exorbitant costs of this journey with your extremely generous donations to the nonprofit HelpHOPELive in honor of Jeff. The expenses are now starting to mount because of all of the factors associated with Jeff’s condition and his journey. There will be many more costs ahead as he continues his recovery, including continued travel costs, caregiving costs, daily medical supplies, medications, and the upcoming co-pays we can expect. There are going to be so many daily expenses that will add up fast. We can’t keep Jeff healthy without you and we’ve only just started this journey. If you can, please consider a tax-deductible donation in Jeff’s honor. All funds raised are managed by the 4-star-rated nonprofit HelpHOPELive and can be used for medical and related costs only. Your kind words, donations, and acts of support show us how much you care about our family. Thank you for your life-giving support. Please stay connected and continue to look out for updates. 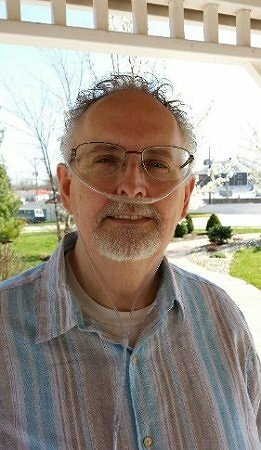 Jeff had his double lung transplant on 11/23/16 and at this point his condition is guarded on his recovery. Update to follow. 7/21. He has received just over 24% of our goal. Thanks to everyone. Update as of 7/11. Jeff needs surgery to repair his esophagus due to acid reflux. Surgery is scheduled for 9/12. Jeff, the neighborhood is pulling for you and for your quick recovery. Looking forward to you being at the Taylor's July 4th party this year. Dear Jeff and Kenny, continued prayers for total healing. Hey Jeff and Ken: Thinking of you often and you are always in my prayers Love and Miss you!!! Sending prayers, energy and healing to you both. So glad it is finally happening. We love you both so very much and hope the transplant will give you a better quality of life than what you've had the last couple years. Always thinking about you two and praying for better times ahead for the both of you. Jeff, I know you will make it through all this, cause you have losts of friends who love and care about you. Prayers and hugs for you!!! We are going to get you funded so you can fly through this process knowing lots of people love and care about you!